There’s some big news on the East West Link today, with Labor saying that if the Supreme Court agrees with the Cities of Moreland and Yarra that the planning approval was invalid, they will rip up the contracts if elected. Read all about it here in The Age. 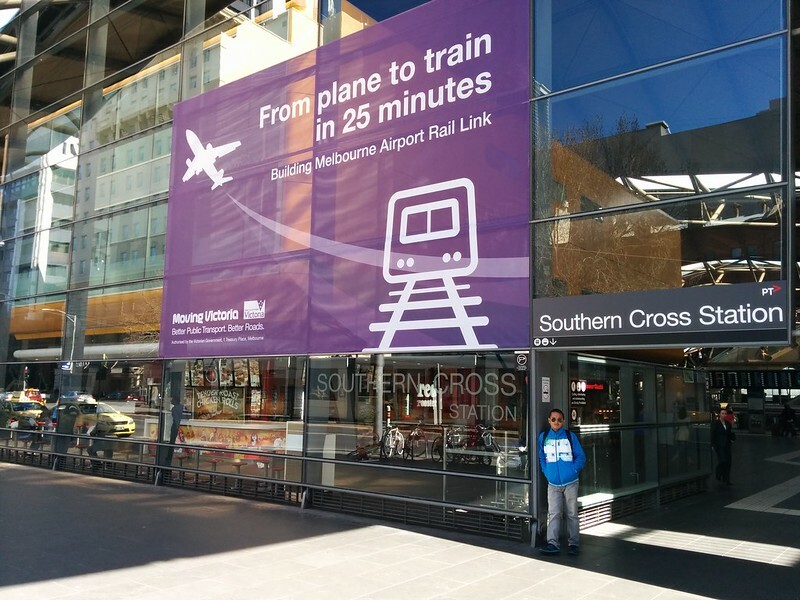 But meanwhile… Lots of ads for the Airport rail link have gone up around Southern Cross Station in the last few days. A bewildered tourist (or blissfully unaware local) might wander around the station looking for this train to the airport that departs every ten minutes and “begins here”. The problem of course is that the link doesn’t exist. It won’t exist for at least a dozen years. And that’s if it goes ahead. 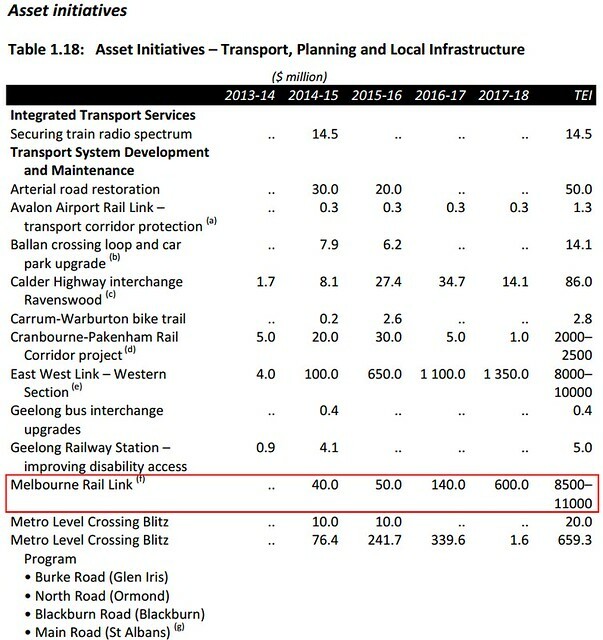 The 2014 Budget Papers show that in the 4 year budget forward estimates period, there’s $850 million of funding, or about 10% of the total cost of Melbourne Rail Link and the Airport Link. This seemed to be confirmed last night by Liberal MP for Caulfield David Southwick at the Glen Eira MTF Transport Forum, who when asked about it said that the current funds would cover extensive planning and preparatory works, with the rest of the money to follow. The danger is that with most of the project as yet unfunded, a government of either flavour could easily put it on ice, just as the Coalition has done with the Metro rail tunnel, which has had many millions of dollars already spent on it. Meanwhile, the ads pile up. In this post I compared the current crop of ads with the Labor ads in 2010. But these have gone a lot further: At least Labor stuck with promoting initiatives that were actually in the delivery phase. Promoting an unfunded plan that may never happen, just months before an election? That really is just a pitch at re-election. 3AW 10/9/2014: Did we miss the train? Next → Next post: Four minutes? Impossible! 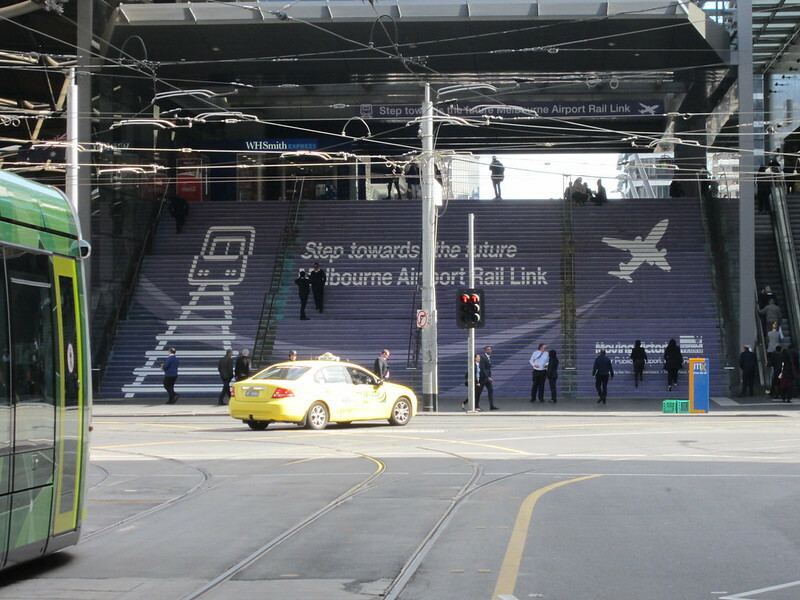 Well, we all support the Melbourne Airport railway. In fact, it is the one that really stands out ‘WE MUST GET THIS DONE’. type of project. However, unless there is a pledge to have this done during this coming term, then it is just a sick joke on the part of the Liberal party. 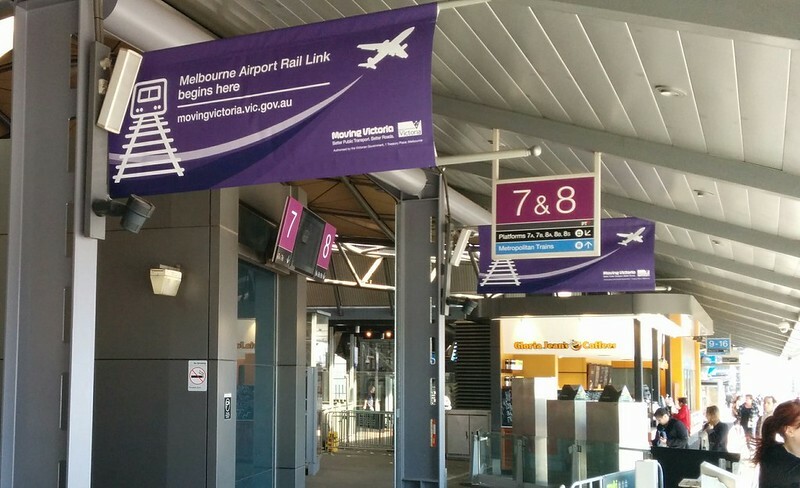 Other railways to Doncaster and Rowville are somewhat important in deed, but Melbourne Airport, at least in a ‘Heathrow Express’ type model, stands out somewhat. I thought exactly the same thing when i saw the signs last week Daniel. What government communications imbecile thought that those ads would be a good idea? They are likely to confuse the hell out of tourists, who will likely wander around aimlessless looking for a train that doesn’t exist. If you’re going to shamelessly play politics wrapped up in ‘non-political advertising’, at least do it properly. That first ad is just damned confusing. 25 minutes between the plane and the train? What do we need to get a shuttle bus to the train station? Is it just an ad for Skybus?! @Julian can’t be, because SkyBus only takes 20 minutes! Indeed, these taxpayer-funded party-political advertisements are getting a little bit ridiculous. There isn’t any public-interest test that would be satisfied that this is an informational advertising campaign. There isn’t a train, they’re not building a train line, they’re not even planning it. So yes, confusing; but ultimately also pretty transparent. As for whether it’s a good idea, I think I’ve been mostly convinced by the argument that making SkyBus reliable (i.e. dedicated full-time bus-lanes or similar) would be a better use of money. Melbourne could actually get pretty far with some good bus infrastructure. 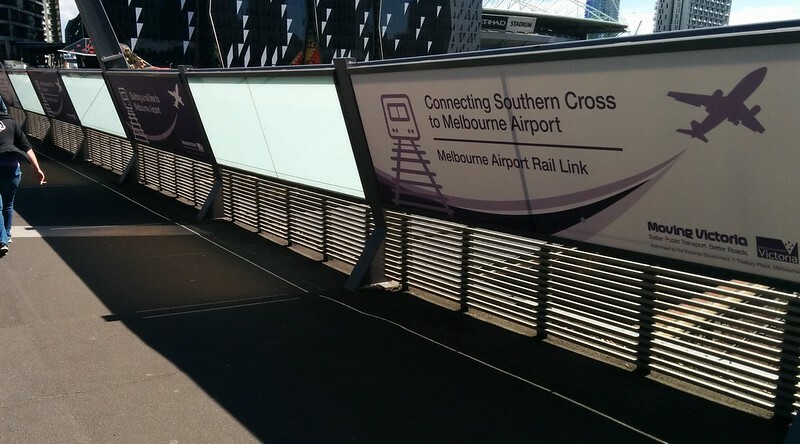 Personally I’m not a fan of the Melbourne Airport Rail Link in its current proposed forms, as an extension of the Melbourne suburban network. Beyond Zero Emissions has done a report into the Melbourne-Sydney link which was very well researched. The only flaw I could find was that the route planning was overly conservative (10km radius curves, instead of smaller curves with more train and track tilt), and so an actual construction plan would probably be considerably cheaper. The current government seems to have gone into overdrive promoting what it claims to have achieved and what it’s “planning” for the transport system. However, I don’t think people are more likely to listen when they feel that they’re being shouted at; rather it is perceived as indicating desperation and in fact becomes counter-productive. .
That walkway bridge crossing is already tacky enough without that advertising. Tranzit Jim, it’s a sick joke on us. We, not the Liberal Party, are paying for all these ads. I’m mystified by the gaps between the bridge posters – noticed them this evening and wondered whether one of the poster options had been judged so misleading that some had been removed, but Daniel’s pic suggests not. But are we paying for to keep the other slots empty so as not to distract people from reading about our exciting [non] railway link? Otherwise surely they’d be let to someone, even at a bargain price?